What is this thing called poetry? 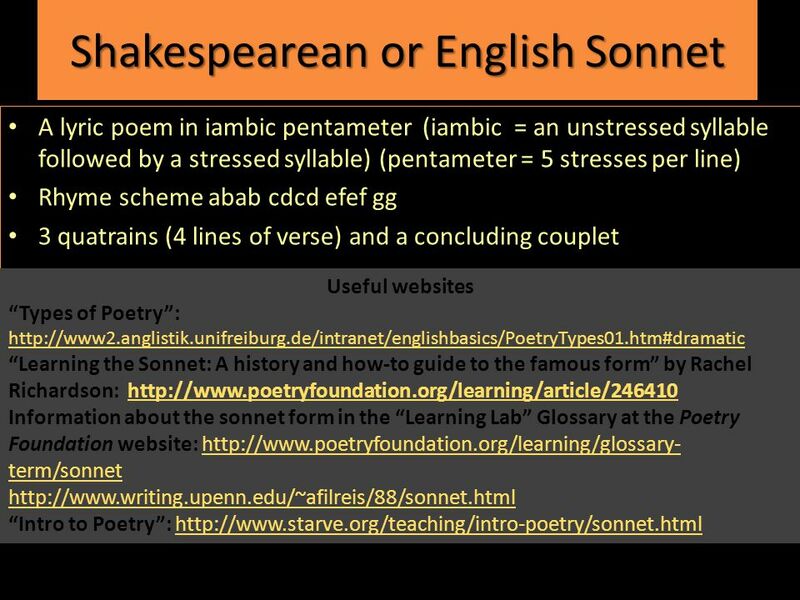 Lecture Four: The Sonnet Poetic form is a poem's involvement with different types of meter, rhyme, and stanza structure. 1 What is this thing called poetry? 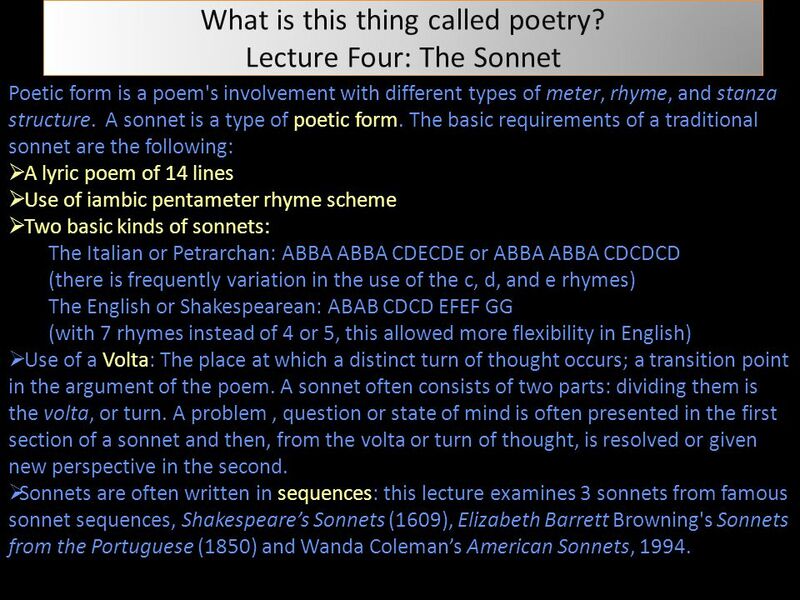 Lecture Four: The Sonnet Poetic form is a poem's involvement with different types of meter, rhyme, and stanza structure. A sonnet is a type of poetic form. 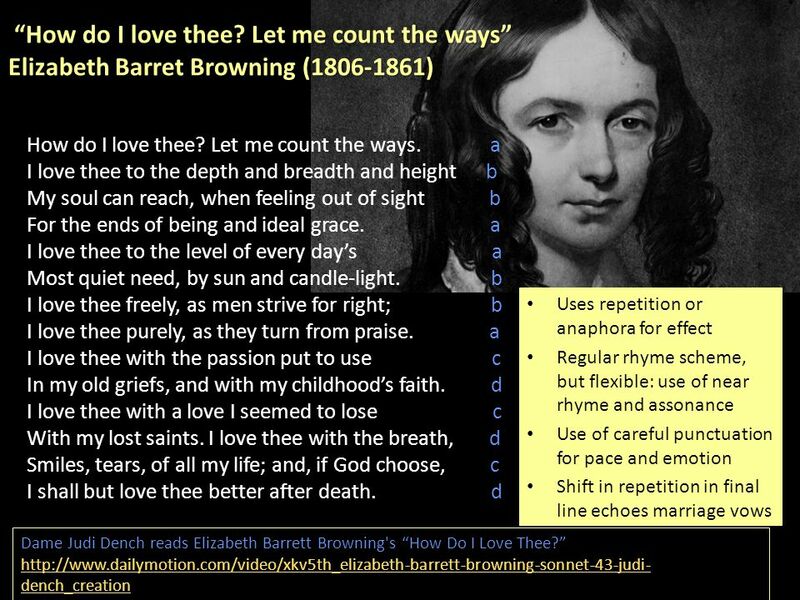 The basic requirements of a traditional sonnet are the following:  A lyric poem of 14 lines  Use of iambic pentameter rhyme scheme  Two basic kinds of sonnets: The Italian or Petrarchan: ABBA ABBA CDECDE or ABBA ABBA CDCDCD (there is frequently variation in the use of the c, d, and e rhymes) The English or Shakespearean: ABAB CDCD EFEF GG (with 7 rhymes instead of 4 or 5, this allowed more flexibility in English)  Use of a Volta: The place at which a distinct turn of thought occurs; a transition point in the argument of the poem. A sonnet often consists of two parts: dividing them is the volta, or turn. A problem, question or state of mind is often presented in the first section of a sonnet and then, from the volta or turn of thought, is resolved or given new perspective in the second. 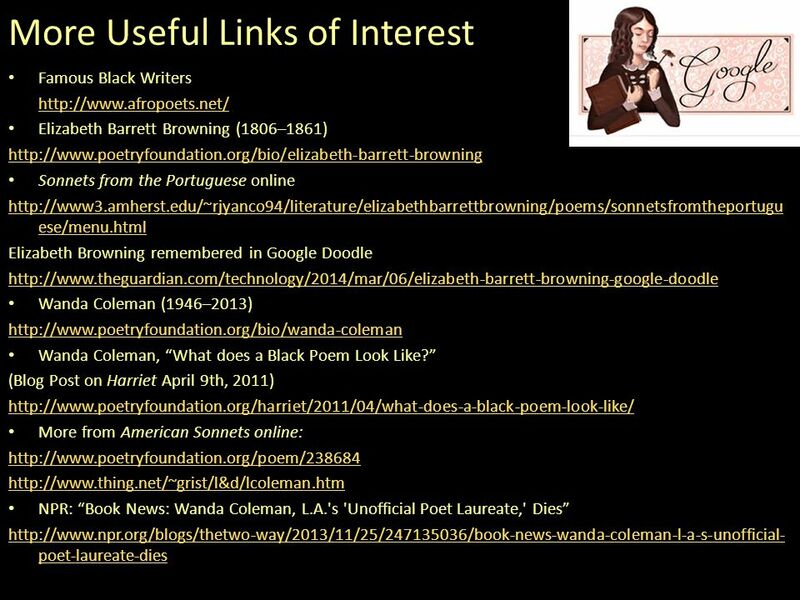  Sonnets are often written in sequences: this lecture examines 3 sonnets from famous sonnet sequences, Shakespeare’s Sonnets (1609), Elizabeth Barrett Browning's Sonnets from the Portuguese (1850) and Wanda Coleman’s American Sonnets, 1994. 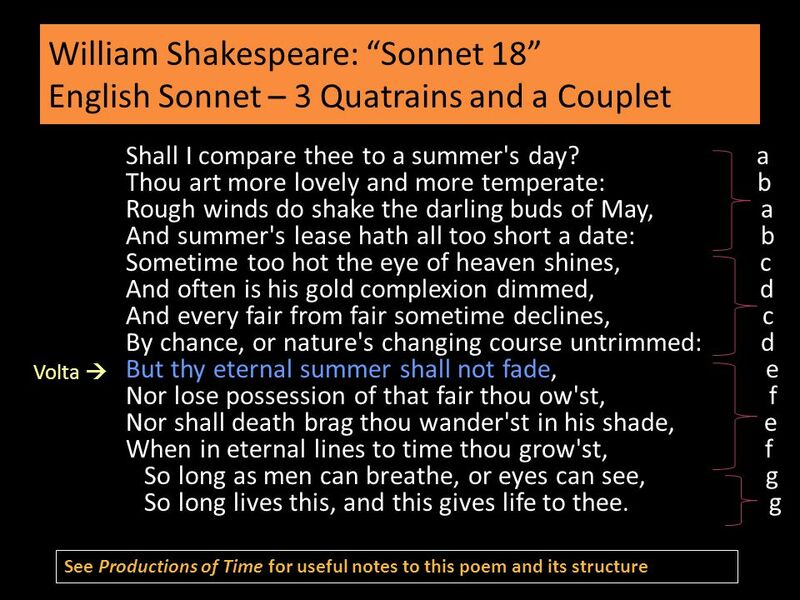 3 Sonnet 18 – William Shakespeare Shall I compare thee to a summer’s day? 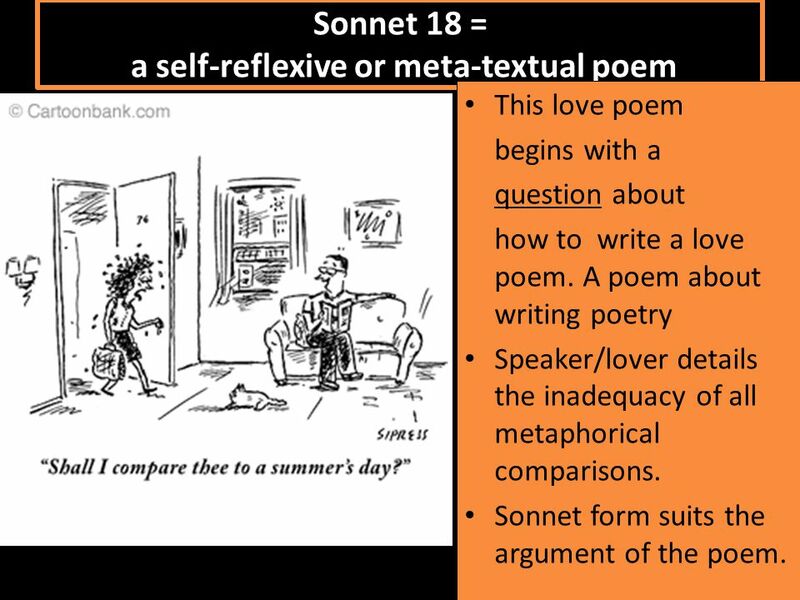 6 Sonnet 18 = a self-reflexive or meta-textual poem This love poem begins with a question about how to write a love poem. 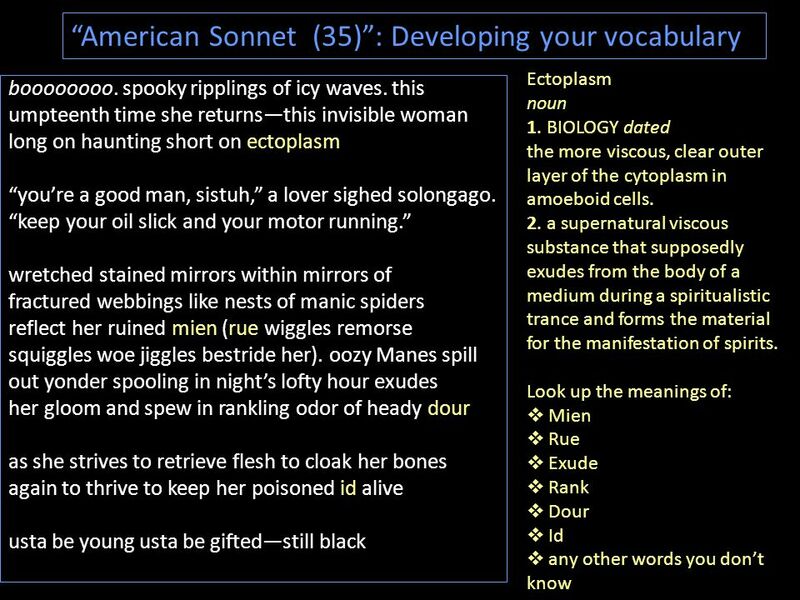 A poem about writing poetry Speaker/lover details the inadequacy of all metaphorical comparisons. Sonnet form suits the argument of the poem. 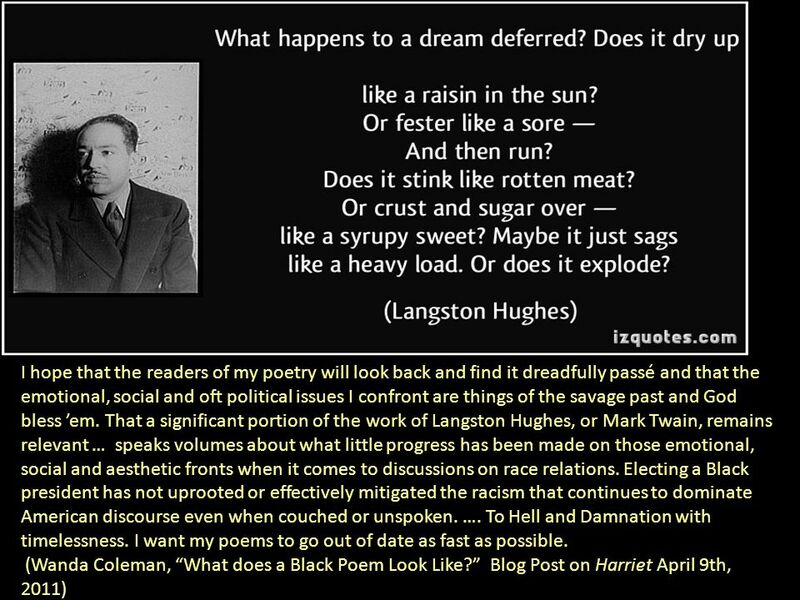 Download ppt "What is this thing called poetry? 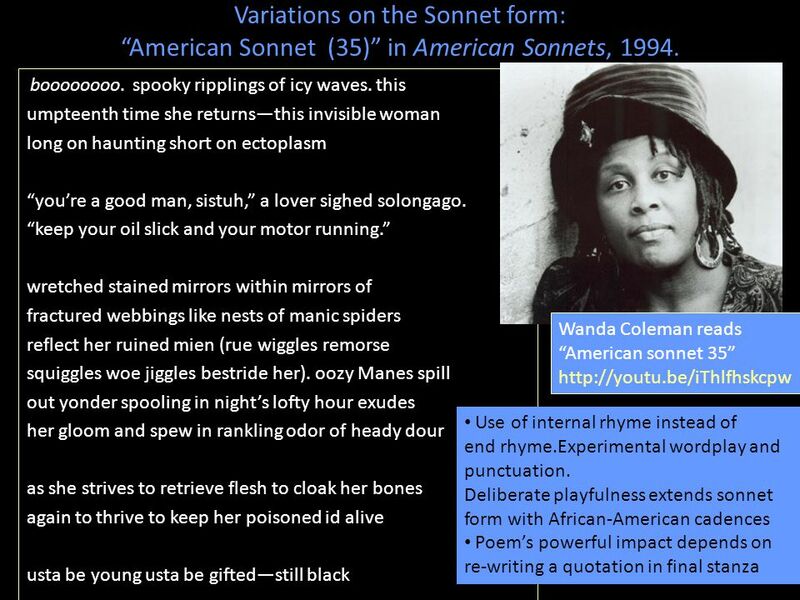 Lecture Four: The Sonnet Poetic form is a poem's involvement with different types of meter, rhyme, and stanza structure." The true originator of the sonnet form was the 14th century Italian poet, Francesco Petrarch, who wrote 366 sonnets for Laura, a woman he loved, but could. 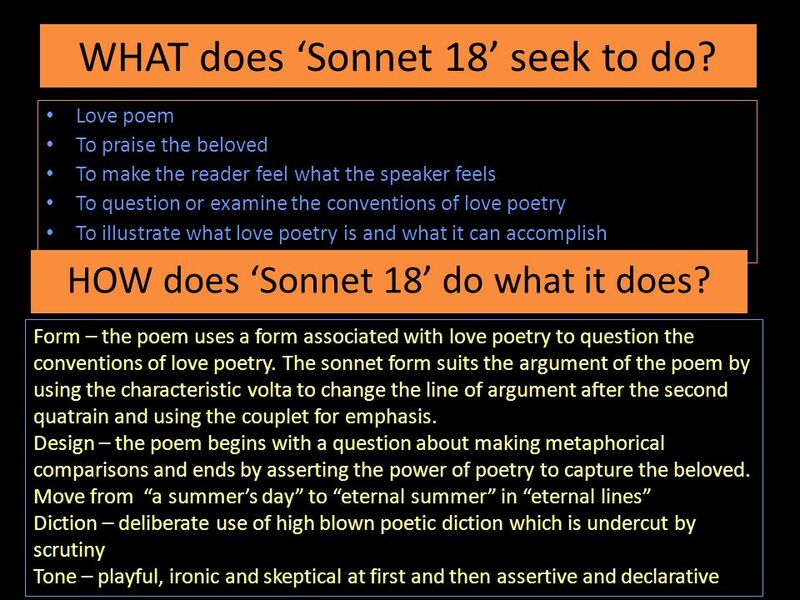 The Anatomy of a Shakespearean Sonnet - mouse over each part of the sonnet to learn more about its structure. Sonnet 18 by Shakespeare Shall I compare. William Shakespeare c b. Stratford-upon- Avon, England Playwright, Poet, Actor Most famous for his plays All but 2 of his 154 sonnets were. Rap with Shakspeare Take notes on Shakespeare’s sonnets. 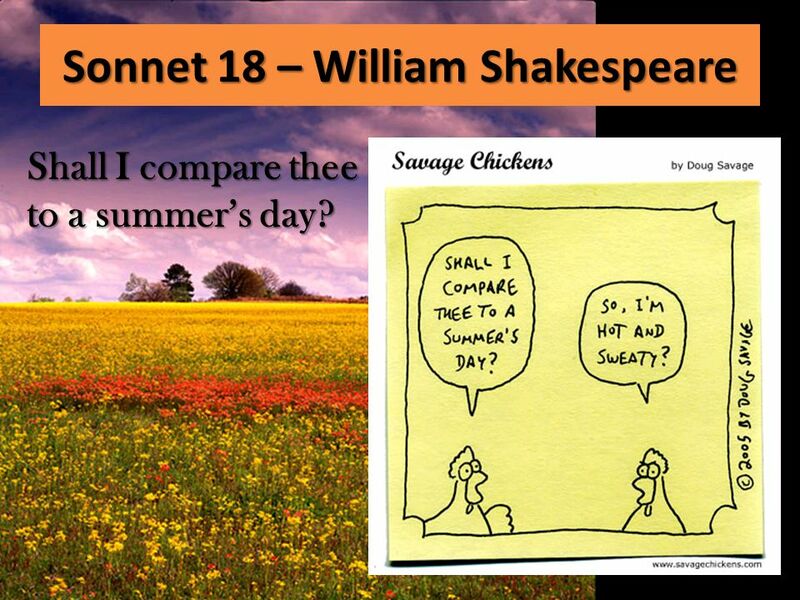 As we take notes, we will also annotate Shakespeare’s most famous sonnet, Sonnet 18. 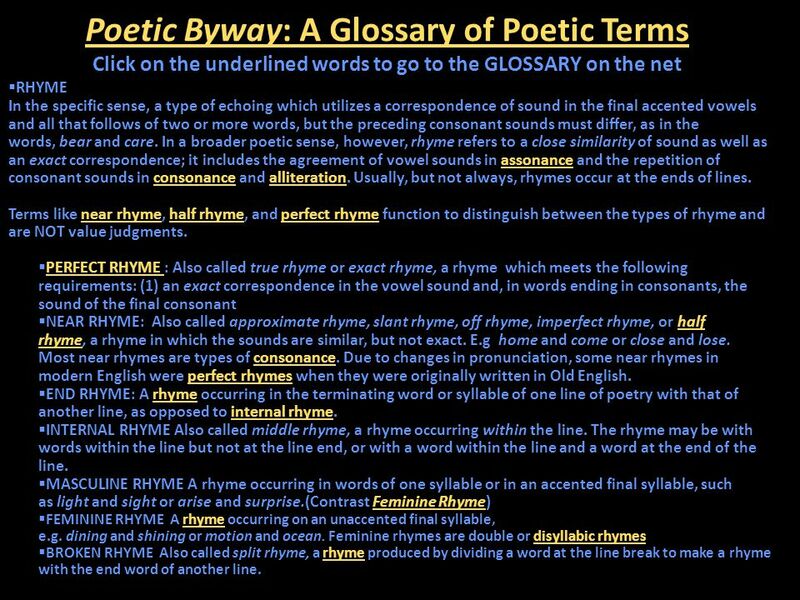 POETRY TERMINOLOGY For all your poetry needs!. 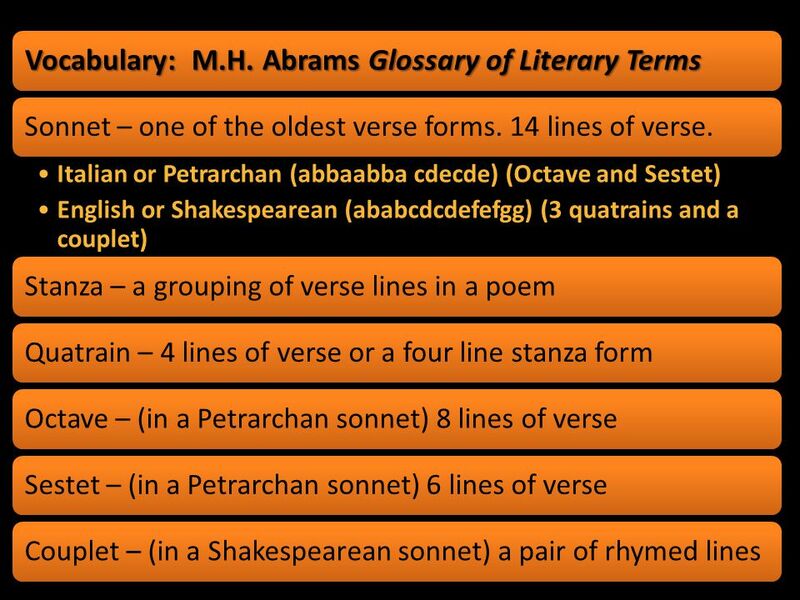 Day 1: Referencing Poetry  Today we are going to learn 4 terms that will help us to talk about poetry.  Who– made famous by William Shakespeare  What– Poetry in special metered form  When—400 years ago  Where—London publishing  Why– may have been meant. Sonnet The Italian poet Petrarch , popularized 14-line lyric poems called “sonettos” or “little songs,” which could be read or sung, accompanied by a lute. 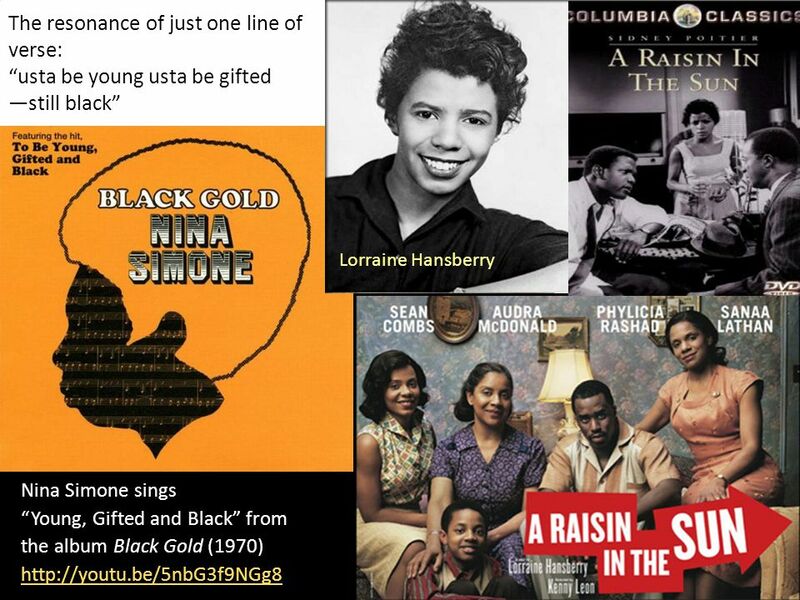 Intro to Poetry Lyric and Narrative.  a lyric poem  consisting of fourteen lines  written in iambic pentameter  with a definite rhyme scheme  and a definite thought structure. SHAKESPEAREAN SONNETS. WILLIAM SHAKESPEARE Made famous by William Shakespeare Wrote many sonnets Many of his plays also written in sonnet form.